Finding the right tool which can help us make an useful video tutorial is really tough . We all are aware of the benefits of video sharing sites like YouTube. From such sites we can not only get free traffic but lots of other things like backlinks, trust, conversions, etc. We can even monetize the videos we share on YouTube and other platforms. SmartPixel is a tool which is really helpful for someone who is very active on youtube & other video sharing sites, how? 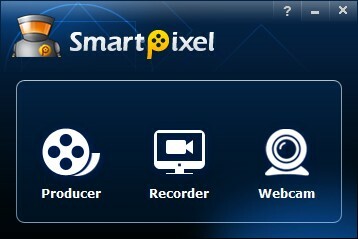 You can record up to full HD quality of screen video or video via webcam of your PC using SmartPixel software. In case you’re looking to get a software, using which you can record screen (helpful in creating tutorials) and directly publish it on YouTube then SmartPixel can be a good choice. You can even edit the videos using this software and this is the reason why it’s a paid one. Yes, you have to buy the license to get its complete features unlocked and also in case you don’t like any watermark on videos you’ll record. I won’t call the user interface very simple but it’s not that tough. It will take time to learn using all of its features. Starting it and recording the screen or video using webcam is really fast and the maximum quality you can get is up to full HD (yes 1080p!). Once you start it then it asks you whether to start the video editor (Producer) or the recorder (Camera). I always started the camera first and once I’m done recording the screen then it automatically shows the link to start the producer to do some editing. Using the Producer you can cut the video from anywhere and shrink its overall length, you can add subtitle, audio and can even regulate the speed at which it plays. Don’t forget to save the project after each update you made. You can import videos or launch camera from the Producer to start recording, save the video, preview it and you can directly upload it to the YouTube channel. There are four columns (set of tools) in the Producer application Project, Screen, Music, Audio, Effect. 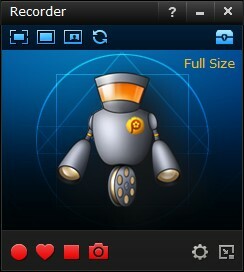 Project part is used to save the video in case you’re creating lots of videos under one project (like a movie). Screen part saves the different versions of the videos which you’ve edited. Yes, the SmartPixel saves different versions so that you can call any previous changes made easily. Using the Music section you can either import the music files from your PC storage or can find it online. Now you can add that music in the video background easily. This is how you can add any kind of music to be played in the background. While using the Audio part you can record any message in your voice and add to the video, in case you missed it doing while recording. Adding audio after recording using this tool is useful because it’s hard to record voice while recording the video. Now come the effects. There are tons of effects you can add. You can add text anywhere in the video screen, change color effects and add special effects. During the first use, software downloaded the set of effects which was little bit annoying but later it was smoothly working. When you’re applying any effect then you can preview it live on the video. Once you’re done then connect the internet and start uploading the video to the YouTube using the share option within the Producer. My overall review while using SmartPixel screen recording and video editing software was superb. I was looking to have a software that can record videos and even allow me to edit them so that I can have full control on what I’m sharing with my users. 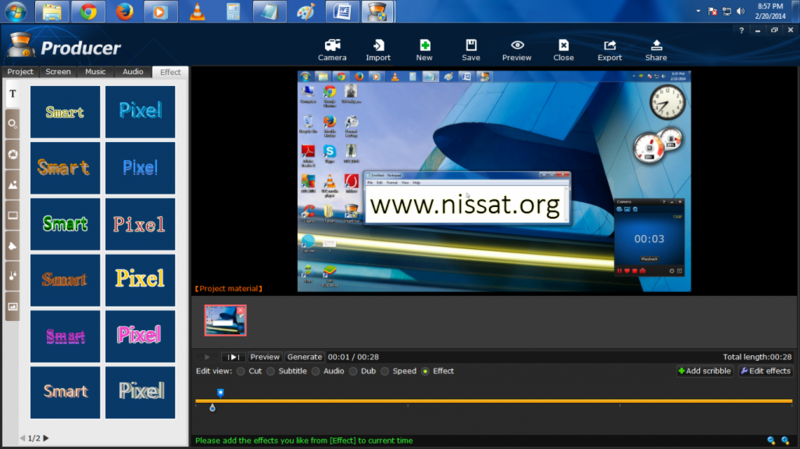 For those who want to create an YouTube channel, SmartPixel is a must have software on their Windows PC. You can try it for free.